All the more reason to replace them with those from the 100 Peers thread. So far there have been some first class suggestions. As long as the new Peers would agree to attend at least 60% of possible sessions, (reasonable excuse such as illness of course accepted), they would exceed the attendance of the Labour and Lib-Dem members. In all honesty I see no reason at all why they should not be in attendance for 100% of the time,illness would reduce this of course,but not by 40% though. Hang on - I view this another way. Don't peers only get paid for days they turn up? So what we have here are Tory peers only turning up when necessary,and hence costing the taxpayer less - something most people on ConHome would normally applaud! And we have, surprise surprise, Lib Dem and Labour peers turning up to trouser their daily attendance allowance more often. Or am I mistaken on how the Lords remuneration works? James: the attendance rates listed are for votes, rather than days on which peers turned up. Peers therefore will have turned up and claimed the allowances on days when there weren't any votes - and may indeed have claimed the allowance on days when there were votes, but not actually voted. So the figures do not necessarily correlate as you suggest - but that's not to say that they don't! "In all honesty I see no reason at all why they should not be in attendance for 100% of the time,illness would reduce this of course,but not by 40% though." Because being a peer of the realm is not a job, it's an honour (hence honour's list, new year's honours, etc); peers often have other jobs to go to, and are in any case not under an obligation to vote if they don't wish to. In many cases there is no point turning up to vote, either because the Conservatives are supporting the bill going through, or because it's a free vote and the individual has no knowledge or experience relevant to the issue. Then there is the question of intentional abstentions. There are myriad reasons why there is no reason to expect a 100% attendance rate. I assume the 100 new Lords would be what are known as "Working Peers" and not merely honorifics for "services rendered"? If so then I would expect them to put in a good attendance, allowing for the fact that some may well have careers elsewhere, families etc. That is why I suggested they promise to give their best efforts to attend for 60% of the possible sessions. Some may well do better than that of course but I feel if one accepts such a position one should put in the work required. Any more fancy, mind numbingly boring excuses as to why the numbers are what they are? I agree with the above that peers appointed for the purpose of serving the country in the House of Lords ought to be expected to be active. 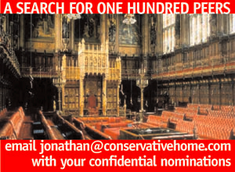 Although as I have said elsewhere, I worry that too many peers are appointed, and support the return of a predominantly hereditary House of Lords. One point, however, that I didn't mention in my earlier comment is that some appointed peers were appointed a long time ago, and may have been active in their day, but are now retired or semi-retired. Not to mention peers who confine themselves to specialist subjects, this is something in the nature of the House of Lords that will apparently inevitably give it lower vote attendance figures. "Any more fancy, mind numbingly boring excuses as to why the numbers are what they are?" So if something is complex or "boring" it can't be true? "So if something is complex or "boring" it can't be true?" Not sure why you'd come out with such a strange comment, after all, that's obviously not what I said, so I'm taking it your not really expecting me to answer! Possible reason for low Tory figures is that theyr peers abstain so often !